A day of free events celebrating Oceanic art and culture, including a curator tour of the exhibition Melanesian art: redux , a choir performance and a screening of newly digitised titles from the National Film and Sound Archive of Australia. 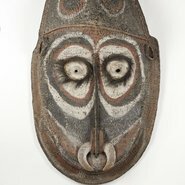 These events accompany the two-day Oceanic Art Society forum titled Aboriginal and Pacific art: collections and artists, then and now . Based on field work done by E A Briggs, a University of Sydney zoologist who walked through the western Torricelli mountains in 1925. The cultures filmed were those of the Gnau and Au people of the Torricelli mountains in today’s Sandaun province (former west Sepik province). Includes scenes of PNG women from the Gazelle Peninsula in northeast New Britain preparing yam, taro, banana and pigs for a feast and men performing a traditional night fire dance. Filmed in January 1972 at Mintima Village near Kundiawa in the Chimbu district of Papua New Guinea.The Naregu people are celebrating the Chimbu pig festival. Footage includes preparation of ceremonial dress, festival dance and aspects of village life. Note: This film contains scenes of customary animal slaughter which may be confronting for some viewers. A film about trying to make a film in Paris when you don’t speak French and you don’t know anybody. The film was undertaken by three Papua New Guinea nationals, graduates of the Skul Bilong Wokim Piksa, PNG’s national film school. The men were invited to attend an Ateliers Varan direct cinema workshop in Paris. The documentary was made during this visit. Celebrate Tokelauan culture through traditional song and dance that explores fishing, island life and faith. The Tokelauan Group began its journey as a youth group in 2007 participating in the Catholic World Youth Day that was held in Sydney in 2008. Since then they have performed at many cultural events, sharing Tokelauan culture.